A summer that promises to be eventful turns into something extra special when the four Melendy children become friends with the ophaned Mark Heron. Elizabeth Enright (1907-1968) was born in Oak Park, Illinois, but spent most of her life in or near New York City. Her mother was a magazine illustrator, while her father was a political cartoonist. Illustration was Enright's original career choice and she studied art in Greenwich, Connecticut; Paris, France; and New York City. After creating her first book in 1935, she developed a taste, and quickly demonstrated a talent, for writing. Throughout her life, she won many awards, including the 1939 John Newbery Medal for Thimble Summer and a 1958 Newbery Honor for Gone-Away Lake. Among her other beloved titles are her books about the Melendy family, including The Saturdays, published in 1941. Enright also wrote short stories for adults, and her work was published in The New Yorker, The Ladies Home Journal, Cosmopolitan, The Yale Review, Harper s, and The Saturday Evening Post. She taught creative writing at Barnard College. 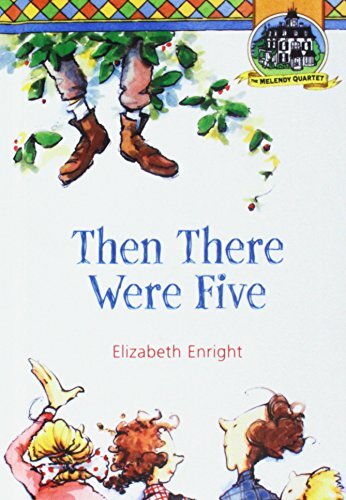 Translated into many languages throughout the world, Elizabeth Enright's stories are for both the young and the young at heart. Favorites from the 1940s series that began with The Saturdays, these stories of rural adventure feature the four Melendy children. In the first book, they befriend an orphan and dam a local stream. In the second, the younger boys receive a series of mysterious letters. Enright's own drawings are reprinted. Ages 8-12. Copyright 1997 Cahners Business Information, Inc.